Housed behind the Rheem campus in a nondescript warehouse are the 4,500 objects that make up the Saint Mary’s College Museum of Art’s collection. Until now, data about the collection has been stored in paper files and an old online system. That is about to change. With the recent arrival of a new collections manager—Robin Bernhard, who came to the College from the Contemporary Jewish Museum in San Francisco—the museum has embarked on a long-term project to recatalog and inventory the entire collection in a new online database. The online cataloging project will preserve the information about each object and maintain the integrity, security, and cultural significance of the works of art and artifacts. It will also give the SMC community and public unprecedented online access to the collection, which will facilitate an entirely new and invigorated visitor experience. Bernhard, who has already begun meticulously sorting through the collection, came across a recent gift of work by artist Stanley Koppel, a founding member of the Graphic Arts Workshop borne from the California Labor School founded in 1945. Early members of the workshop pursued social justice through the graphic arts. This collection is an important donation to the museum and College as it offers students and the community the chance to interact and examine first-hand documents that support and strengthen the core Lasallian principle of social justice. The collection includes the William Keith Collection of late 19th- and early 20th-century California landscapes and portraits, historical and contemporary landscape paintings with a focus on California, works on paper consisting of primarily American and European prints and photography, sculpture focused on religious icons and contemporary sculpture, and an ethnographic collection drawn from Africa, Central America, Asia, and North America. Over the next few years, Bernhard and museum staff will inventory every object in the collection, update historical research, exhibition history, conservation reports and requirements, and import all information into a database accessible to the community. 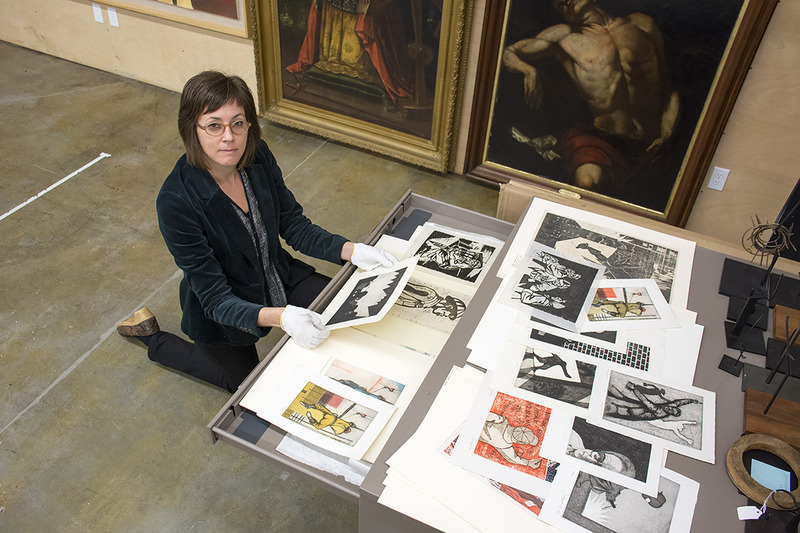 Bernhard received her training in preservation studies, art collection management, care of collections, and paper conservation at the International Preservation Center, the George Eastman House, and the Balboa Conservation Center. This project promotes collaborative learning by allowing for a hands-on teaching experience that fosters innovation and creativity. There will be opportunities for faculty and students to develop research, curate exhibitions, and delve further into the collection. Cataloging the collection is labor-intensive and time-consuming. While the museum staff is gearing up to share their discoveries with the public, there will be a brief time when staff will use the exhibition space to assess the collection. This means the museum will be closed to the public from June to December 2017. However, during this time the museum will continue to engage the SMC community and the public through innovative programming and events including private guided tours of the museum’s collection. Also, visitors can stay up to date with the collections project on the museum’s website (stmarys-ca.edu/museum), read a Q-and-A with Bernhard, and watch as she uncovers ancient artifacts and discovers more hidden treasures soon to be on display for everyone to admire. This new participatory experience through exhibitions, programming, and access to the collection is specifically designed to engage all audiences—students, faculty, staff, and the public.